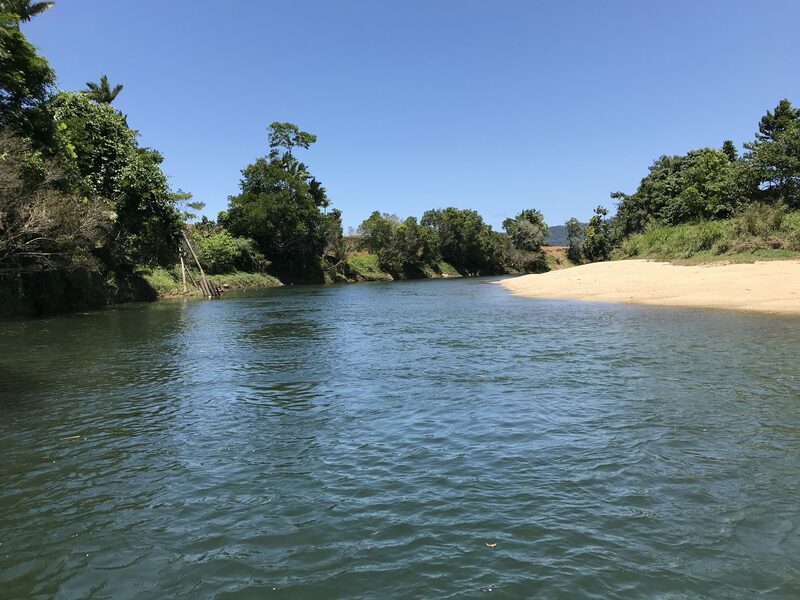 Perhaps not as well known as the Daintree River to the north, these twin rivers still offer exceptional light tackle sportfishing when conditions are right. 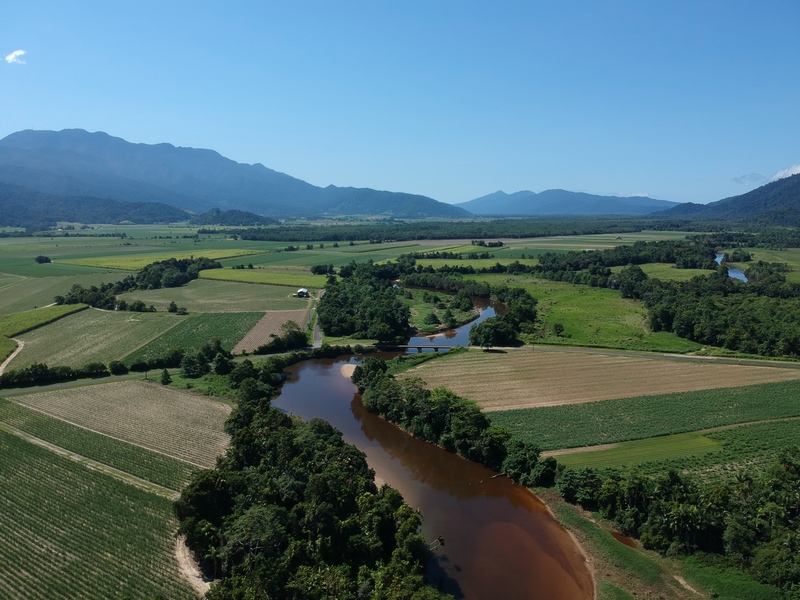 The Russell River rises in the Great Dividing Range, south of Babinda and travels east to the coast until it hits the high coastal ranges which divert it to the north. The Mulgrave River rises further north, collides with the same coastal mountains and is diverted south. These rivers then merge and flow to the sea through a common mouth, Mutchero Inlet, more commonly known as Russell Heads. They are not as large as the Daintree but are probably more scenic with high rain forest clad mountains cascading right down to the waters edge. The spectacular backdrop of rugged mountains contains Mount Bellenden Ker, the second highest mountain in Queensland. The unique geographic feature through which these rivers flow, having two main mountain ranges, the coastal and inland ridges, sitting opposed to the prevailing south east winds ensures torrential rainfall occurs in this region quite frequently. This area is arguably the wettest region of Australia. The district towns of Babinda, Tully and Topaz vying for the annual Golden Gum Boot award which is proudly accepted for the wettest place in Oz. Metres of rain fall during the summer months sending warm sediment filled waters cascading down the mountains to flood this relatively narrow valley. 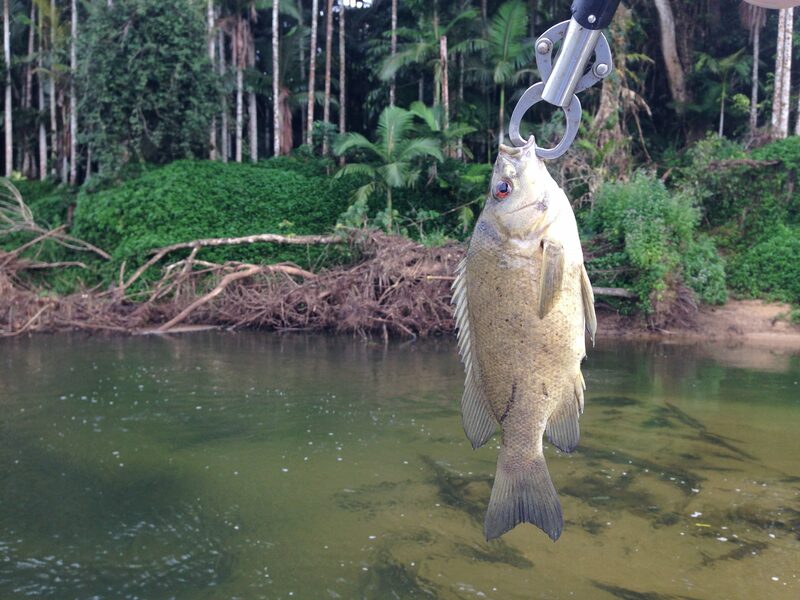 If the timing is right, 2-3 days following these floods will see spectacular lure fishing for Barramundi. 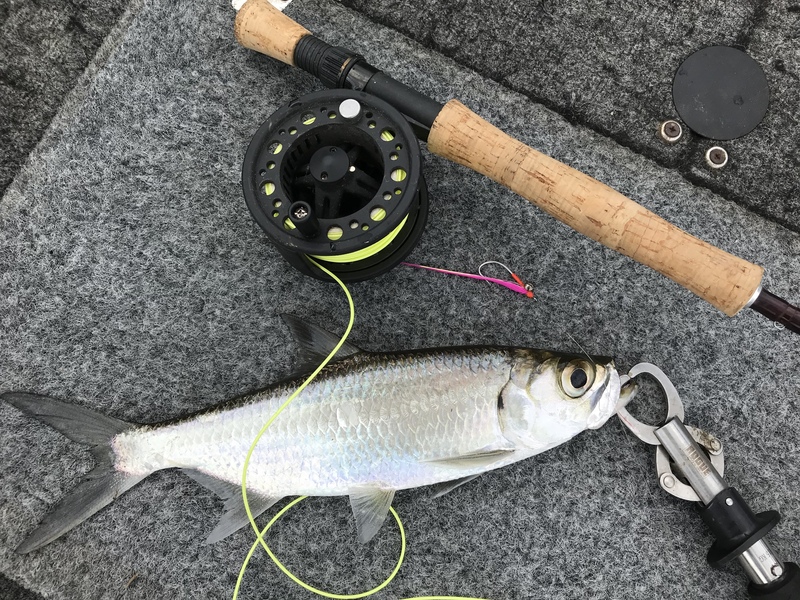 As the waters recede back into the main river bed, the backwaters, lagoons and creeks bring all manner of food to the hungry fish and casting shallow diving lures to these locations will produce good numbers of medium sized Barra. Look for water color changes, small feeder creeks and skittish baitfish. The Russell River usually carries more water and local flooding of this river can be severe, even while the Mulgrave remains quite fishable. Local knowledge is paramount here. 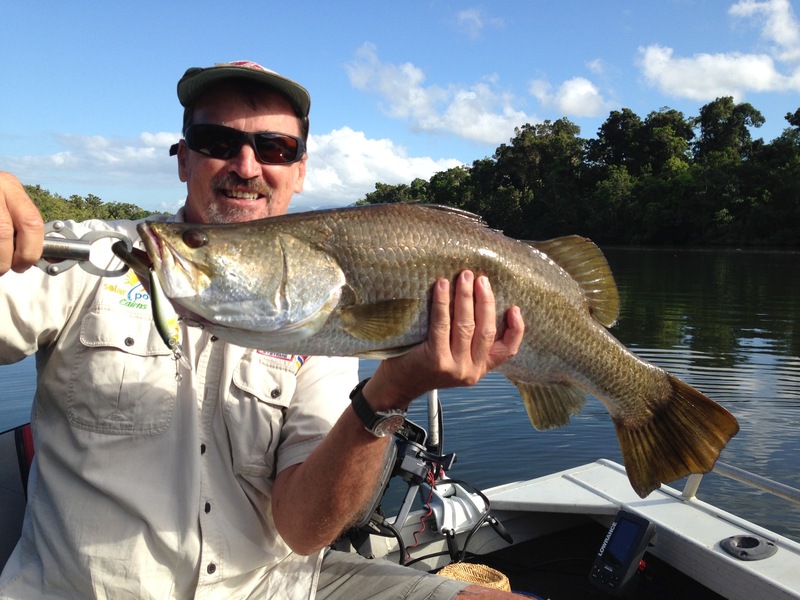 The pre and post wet season periods (September to November and March to April) are probably the most reliable times to fish these systems for Barra. During the cooler months the fresh water begins to clear from the inter tidal zones. 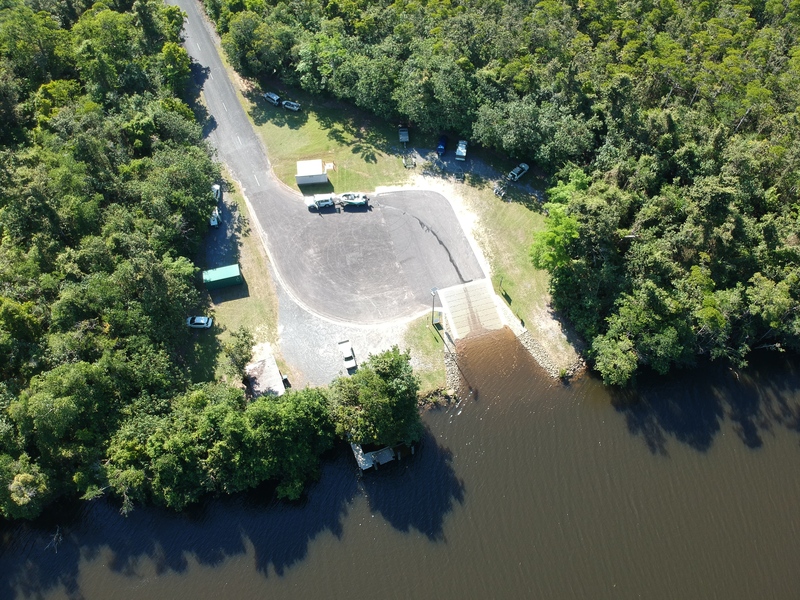 Each successive high tide brings more salt water and baitfish further up the system, past the “T” junction and up to the boat launching ramps situated in both rivers at Deeral and Bellenden Ker. August-September is prime time for big Queenfish and GT’s. Fish to over a metre long will patrol the sandbar edges and channels and can either be caught using live sardines or poppers and fizzers. The waterway around the “T” junction is a renowned big Queenie spot and once the word is out that they are on, dozens of boat will try their luck in this vicinity. Drifting along the mangrove edges casting deep diving lures will also produce Barra, Jacks, Trevally, Cod and Bream, while Flathead will come from the mud and sand flats. Right upstream, the clean fresh water will produce small Barra, Jacks, Sooty Grunter and Jungle Perch. The northern bank of the river mouth has been continually eroded by wet season flood waters. Many mangrove trees and old root systems lie along this bank. It is a great place to target Fingermark, Barra, Bream, Jacks and Cod on bait. The slow moving water around the bottom of the turn is best. A good quality sounder will locate this structure for you. Also refer to Rigs And Bait Section. These rivers are also fairly shallow. The unwary skipper could easily grind their boat to a sudden halt on one of the many sand bars. Learn to read the river, look for the steeper banks usually associated with deeper water channels and if in doubt slow down until you are sure it is safe to proceed. Remember the seasonal target groups. Follow the tides up and down the system fishing according to the strength of water flow and target species. Lure fishing in the salt is best during the bottom of the tide. The deep snags become an easy target for the accurate caster and many prime fish can be encountered. Crocs are present in this system, take usual care and never swim in these waters. For charter options available for this beautiful tropical waterway check out the Calm Water Charters section.